Maybe this countdown will end up much like the upcoming season. Pitchers have dominated early and often so far, and most St. Louis fans would be just fine without any extra stress for say…five months or so? Okay, so it may be pushing it just a little to bank on having a set rotation for even half that time, but the Cardinals have proven to shine in making necessary moves in order to reach October. Rewind back to the summer of 2006, and there is one transaction in particular that barely moved the needle. Weaver was only credited with 15 regular season appearances wearing the #36 Birds on the Bat jersey, but it is what he did that fall that gets his picture at the top of this post. More importantly than that, however, for the legions of fans that were crushed just two years earlier came redemption in an unlikely source. Weaver had been traded three times, and St. Louis was his fifth different organization all before he turned 30. His career may best be known for the faith he had in his agent, and Scott Boras freely shopped his right arm around to the highest bidder. Luckily for the Cardinals, Weaver got off to a disastrous start in the ’06 campaign, and Walt Jocketty took full advantage. That July, after watching the Sidney Ponson experience fail, Weaver entered as a last resort. Everyone remembers how that postseason ended, but what about the three months after that? 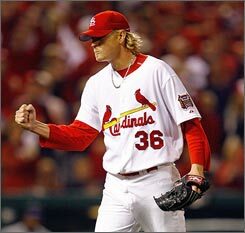 Sure, the World Series title was nice and all, but don’t forget that Weaver was wanted back under the Arch in a big way. Leave it to a couple of hard-headed individuals in Boras and TLR to fight over a journeyman. Thankfully for once the money worked against the defending champs since Weaver was essentially done. For the most part, it has been a string of relievers in the twilight of their careers that call this number home starting with Kaat and on down the line from Springer to Choate. The exception in this case is Denny, who was drafted by the Cardinals and spent the last half of the 1970’s in the rotation. Even he had a memorable story with the exit, getting dealt to Cleveland for Bobby Bonds. I’ll definitely be watching with anticipation to see how this jersey gets passed down next!